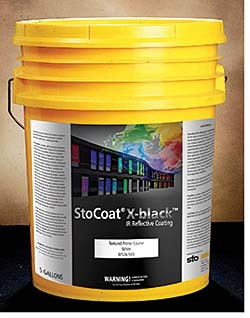 StoCoat X-black exterior wall coating reflects the sun's near infrared light energy and helps diffuse heat evenly across the wall, providing a "passive" cooling technique. It can be applied on most claddings, including EIFS, stucco, concrete, wood, brick, or pre-painted surfaces, and is available in 570 colors. The 100 percent acrylic resin system resists fading.